Seen by most as a captivating, beautiful species, the giraffe has been a character in many myths and legends throughout time. Scholars of the past have been at a loss of words to describe their fascinating characteristics such as their long necks and limbs. Many myths deemed the now known giraffe as rather a camelopard, half camel and half leopard due to its features. 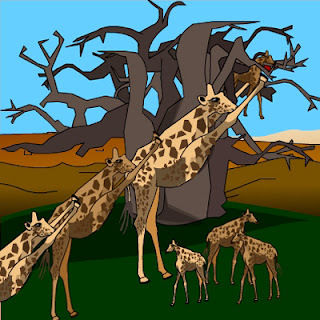 Another myth is one that not only incorporates how giraffes got their long necks, but also how they obtained their name. “Hades and Boulder threw a rock on the head of an animal that resembled a leopard, says Nick's Myth Page. Zeus had a strong man remove the rock from the animal, but not before it had stretched out its neck to twice its normal length trying to free itself. Zeus asked the animal its name, and it replied "Gerald Raffe." 2. Talley, Trevor. "Myths & Legends of the Giraffe." EHow. EHow.Com, 27 Mar. 2011. Web. 06 Nov.
thanks for posting this blog. its really very helpful for us.